The U.S. currency also came under pressure from a rebound in the euro and sterling after pro-Brexit lawmakers in British Prime Minister Theresa May's party publicly pledged support for her despite disagreeing with her Brexit proposals. "We have a lot of Brexit headlines in recent days which are conciliatory," said Paresh Upadhyaya, director of currency strategy at Amundi Pioneer Investments in Boston. "The dollar was also pressured by the news of a U.S. proposal to renew trade talks with China." Anxiety about the escalating U.S.-China trade conflict has hurt the yuan and emerging market currencies as U.S. President Donald Trump has threatened to impose more tariffs on Chinese imports in a bid to address a record U.S. trade deficit with China. An index that tracks the greenback against the euro, yen, sterling and three other currencies (.DXY) was down0.49 percent at 94.787. The euro was up 0.26 percent at $1.16350 and was little changed at 89.05 pence . 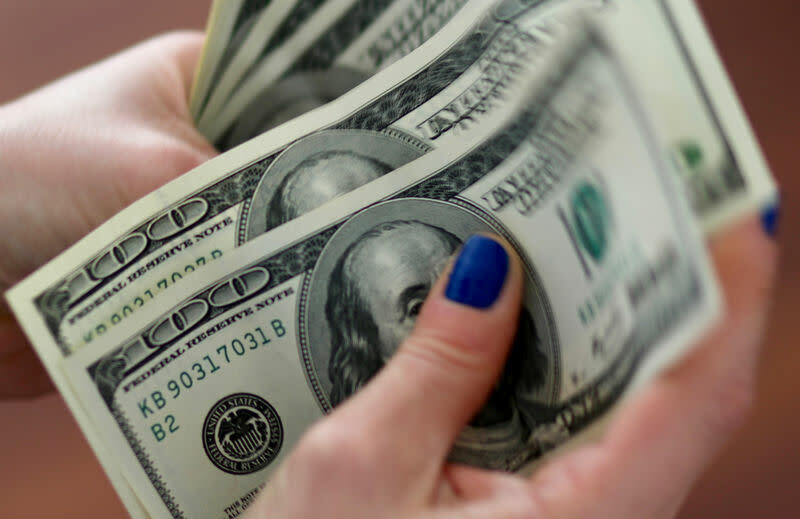 The dollar's weakness helped emerging markets recover from their earlier losses when the Indian rupee hit an all-time low at 72.91 per U.S. dollar. The Federal Reserve's latest Beige Book showed the U.S. economy grew at a moderate pace in recent weeks even as businesses worried about international trade tensions.